For guidelines on the Lore section, see UESPWiki:Lore. The events of the Elder Scrolls unfold on the vast continent of Tamriel, located on the planet of Nirn (one of the Planes of Existence) in the realm of Mundus. 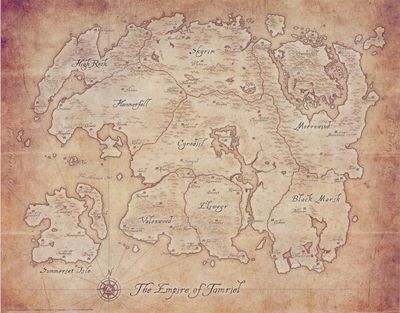 Aldmeris for "Dawn's Beauty" and Ehlnofex for "Starry Heart", Tamriel is home to nine distinct provinces: Black Marsh, Cyrodiil, Elsweyr, Hammerfell, High Rock, Morrowind, Skyrim, Summerset Isle, and Valenwood. A list of alchemical ingredients. A list of all historical items of great power. An archive of known creatures and constructs making their home in Tamriel and Oblivion. A list containing descriptions of the various orders and guilds in existence within Tamriel. Information about the plants that can be found growing in Tamriel, especially those that can be used for alchemy. Descriptions of all the deities, major and minor, presiding over the land. Pantheons for each race are also listed. A history of the world, containing timelines chronicling the major events of Tamriel's vivid past. A compilation of important writings in Tamriel. A list—with brief biographical descriptions—of the famous and infamous characters of Tamriel. Information about the various regions, provinces, and cities of Tamriel. Numerous races flourish across Nirn. Some are rare, others live in remote areas or dwell on different planes of existence, while others are believed to be purely mythical. Articles on language, calendars, lineages, magic, and other miscellaneous subjects may be found in the appendices. This page was last modified on 9 November 2018, at 14:01.